It’s one of the oldest cities in Europe and offers wonderful glimpses into Portugal’s layers of time and influence – needless to say we were very excited to get going on our 3 days in Lisbon adventure! It was the Age of Discovery when Portugal ruled the world, stretching a hand (as well as culture and language) across the globe, from Brazil to China, Africa and beyond. Set upon seven hills, imagine old-world trams bustling along narrow, cobbled streets; grand architecture, quirky stores scaling hilltops, and colourful rooftops as far as the eye can see. We flew in for a Christmas city break and managed to cram quite a bit into our 3 days in Lisbon itinerary. I’ve shared our discoveries below, and hopefully you’ll be inspired to book a trip soon too. In your research on travel to Lisbon, you’ll find there’s a few main areas within the city’s old ‘centre’ and along the waterfront. ‘Old town’ Alfama, Castelo and Graça: cobbled streets and amazing views from Castelo de São Jorge, Largo das Portas do Sol and Miradouro da Senhora do Monte. Usually reached by tram from streets around Rossio and Baixa. Rossio and Baixa, Lisbon’s riverfront gateway sitting below Alfama, with bustling trams, Elevador de Santa Justa and the charming Praça do Comércio to name just a few highlights. Bairro Alto and Chiado, particularly good for dining and nightlife. These areas are along the waterfront and within easy walking distance of Rossio and Praça do Comércio – all of this is close together and easy to explore on foot. Belém, a little further along the waterfront and overlooking the Ponte 25 de Abril (bridge); with its pastries, and historical charms like Jerónimos Monastery, Belém Tower on the banks of Tagus River, and Padrão dos Descobrimentos (Monument of the Discoveries) celebrating travellers from the Portuguese Age of Discovery. We stayed not far from Rossio Square (pictured below), overlooking São Jorge Castle. This was a perfect spot for exploring a large portion of the older part of town around Rossio and Baixa on foot. Or you can easily catch a tram around here, including the famous no. 28. Day one on your 3 days in Lisbon itinerary is best spent getting your bearings in this area. Start early at Santa Justa lift to avoid the queues. Head up high and take a look around this beautiful city. From here, you can also get an early start on the trams including the no. 28 which is famous for the pretty and historical route it takes; also the tourist options like the Yellow buses or trams (very good value for a 48 or 72 hour pass, if you ask us), or wander around and go shopping. On your adventure, head for (or you’ll inevitably stumble upon) Praça do Comércio (pictured below), gateway to the lovely waterfront here. There’s a romantic promenade along the front of the city, where you can enjoy excellent views looking back up onto the hills and Lisbon’s colourful canvas, plus out to sea where so many have taken to the waters for an adventure before you. The reason I suggest you spend a little time in these parts along and around the waterfront, is so you can get a good sense of the rich history all around you. In its heyday these parts of town were wealthy – some of the wealthiest in the world, in fact. This was thanks to trading happening in the 16th Century in gold, spices, silks and jewels among other things. Not to mention Portugal, alongside rival Spain, ruling half the world! Fast forward to 9.40am on 1 November 1755 though – three major earthquakes hit as Lisbon’s residents celebrated Mass for All Saints Day. These earthquakes triggered a devastating fire and tsunami, destroying much of the city. About a third of Lisbon’s 270,000 inhabitants died. From this tragedy emerged a hero, Sebastiao de Melo, who set about reconstructing the city from the ashes. Together with architects and engineers, he made sure the city’s new design was earthquake-proof, and developed one of the world’s first grid systems that we see implemented in so many major cities to this day. There’s a lot I didn’t know about Portugal, and across our 3 days in Lisbon I continued to be more and more fascinated! For instance, the country was run by a dictator, António de Oliveira Salazar, who was prime minister between 1937 and 1968. A contemporary of Hitler, Franco and Mussolini, Salazar is remembered by some as the greatest figure in the Portugal’s history, but by others as keeping the country repressed and backwards. Salazar was overthrown in 1974. Lisbon’s huge suspension bridge (resembles the Golden Gate in San Francisco and was built by the same company) was renamed Ponte 25 de Abril, or ‘April 25 Bridge’ (my birth date!) to mark the event. Across the city there’s a fascinating legacy hailing from Lisbon’s Arabic roots – tiles, known as Azulejos. These date as far back as the 13th Century, when the Moors invaded Portugal and Spain (per a contemporary map. The Moors secured their foothold in Portuguese culture between the 16th and 17th Centuries and used Azulejos to decorate plain walls of buildings. These beautiful little polished stones adorn old walls still. Thankfully not all was lost in 1755. I was also happy to learn that St Anthony was born here (coincidentally buried in Verona, Italy, where we are visiting in April). All through childhood, my mum used to tell us to ask St Anthony for help if we lost something. Somehow, this always did the trick. The link to St Anthony here was more sentimental for me than anything else (and I did by mum a memento to thank her for all the times her advice helped me recover missing things). The Lisbon Sardine Festival (sardines and other canned fish are a BIG industry here) celebrates St Anthony’s life and brings everyone out into the streets for a party every June. A couple of places that I wanted to find but that were closed over Christmas, and perhaps worth adding to your list, are the storybook-themed Fabulas and Pharmacia cafes/restaurants (in the Bairro Alto / Chiado area). Lisbon is known for offering quirky experiences to locals and visitors alike. The TimeOut Market (Mercado da Ribeira, pictured above) is also within walking distance in Chiado – only about ten minutes walk from Praça do Comércio in fact. It’s cool for an evening outing, with a large variety of food and drinks on offer to try. A word of warning, it’s definitely not the cheapest spot in town, although is definitely worth a visit. Whether you’re enjoying a self-guided tour on local transport or have taken advantage of one of the tour operators (the Yellow tour brand appears to have the upper hand in Lisbon in terms of tour options and best value), add Belém to your list for the day. In Belém you can’t miss the romantic Coach Museum, stunning Jerónimos Monastery (pictured below) and Padrão dos Descobrimentos the inspired explorers’ monument that’s along the waterfront (in front of Jerónimos Monastery). Wander a bit further past the monument and you’ll come across the medieval Belém Tower (pictured below) which is fascinating for its architecture alone, not to mention its prime spot by the river. There’s a lot to do in this little area that’s about twenty minutes from the centre of town. Give yourself time to deal with any queues at the monastery and tower. You can’t go to Lisbon and not try a Pastel de Nata (Portuguese custard tart). They’re everywhere, sweet and delicious! Try at least one from Pastéis de Belém, where they’ve been making these according to a top-secret recipe since 1837. The city is best experienced from up high, so to wrap up your day, find a rooftop bar for a cocktail as the sun sets. Many hotels have their own roof bar, but the Mundial Hotel in the middle of the city near Rossio Square is well known, as is the luxe Topo (although this appears to be a summer destination). If you’re up for it, there’s one more stop to make – pop into a Ginjinha shop like Ginginha Sem Rival around Rossio Square and enjoy a shot (or two) of this delicious and inexpensive local delight. It’s a sour cherry liqueur (tastes like Port) that has been served in the city since 1890, and it’ll knock your socks off if you have too many in a row. Tip: Before your visit, have a look at the Discover Walks website. They offer a range of free and inexpensive walking tours of Lisbon, including around Belém, so you can gather all the knowledge and inside secrets from a local! Today you might want to start early and catch a ride on the famous no. 28 tram. Ride a lap and eventually get off in historical Alfama – it’s about a ten to fifteen-minute tram ride from the city centre (e.g. Rossio Square or Praça do Comércio) up into the hills. Alfama is colourful, interesting and easy to get lost in, so give yourself time to find the best views. 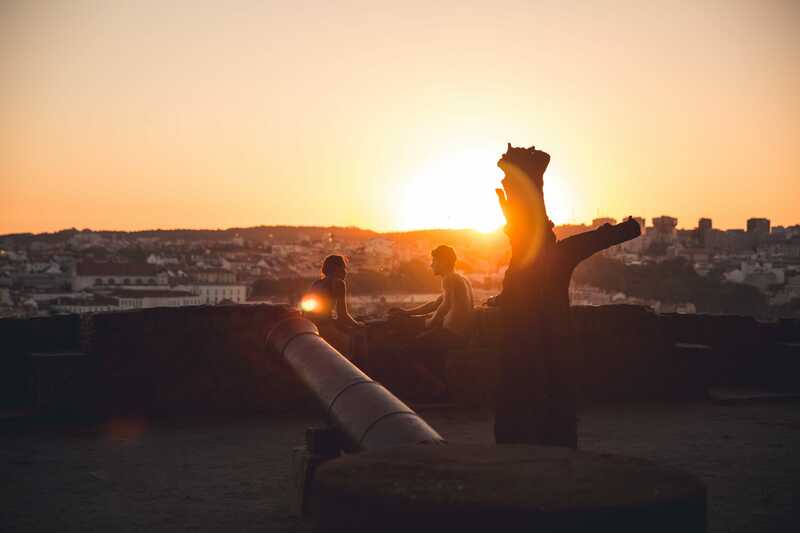 Trip happily along the cobbled streets, and visit the historical sites like São Jorge Castle or the Moorish Gateway, Largo das Portas do Sol that also offers postcard-perfect views. Tip: See if you can find the quirky and cool circus school Chapito, where you can eat or have a drink. The view is excellent and you might even witness a bit of a show. Back in town, head towards Praça do Comércio, the old place of international trade in the Age of Discovery and home for the Royal Family. It’s often lit up to showcase a magical spectacle. Wander along the waterfront and then back up the hill towards Bairro Alto where there’s a few fun rows of streets that boast a selection of bars, restaurants and clubs. Be careful though – we headed out for an innocent dinner but after being lured into a bar playing cool dance music, two free shots later (courtesy a generous barman), we ended up on a bigger night than anticipated. Oh who am I kidding? It was awesome! I did a lot of research trying to figure out the best area to stay in that was convenient to everything. I settled on the stylish Lisboa Pessoa Hotel near Rossio Square, that’s nestled on a hilltop overlooking São Jorge Castle. I’d recommend the area and the hotel. It gets very busy in the summer season (May to August), and while it’s cooler in the autumn/winter months, everything is still open, and you’ll avoid the crowds. Late December was cooler than we had anticipated. Take warm clothes. There is sun though so that’s a bonus, but in the wind it is chilly. Pretty much everything was open over Christmas though which was great (some places shut down for many days across the period). While you could spend so much more than 3 days in Lisbon, it’s a taster to get you ready for the next trip. That’s our thinking anyway! As a city break at Christmas, it’s ideal. Busier even than Mallorca and definitely Ibiza – they have different things to offer at Christmastime though. If you’ve been to Lisbon and have tips, please do share with us in the comments below. And any questions, you know where to find us. This is Great, i love to travel lisbon. It’s a fab city, hope you can get there soon Masum!